Herringbone and Sui are a bespoke service that aims to encapsulate every man’s personal style vis a vis the customising order. 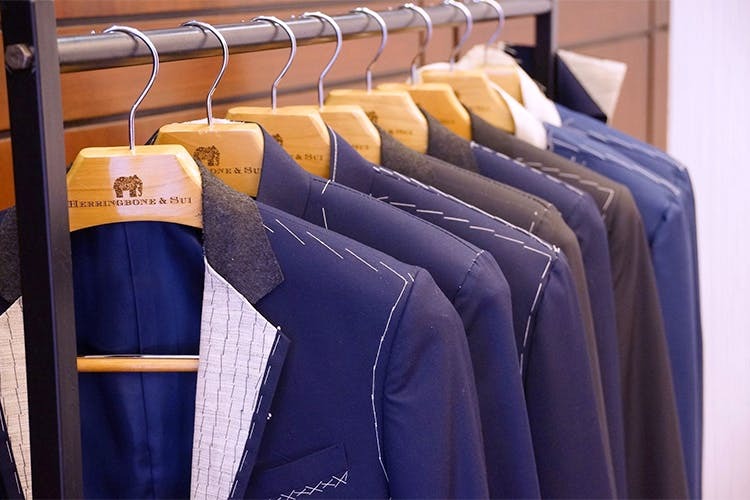 Founded out of love for custom-made suits and fine fabrics, Kabir Mehra and Samarth Hegde started this venture off while they were studying in the US. Once they returned to India, the plan was set in motion, and voila – a luxury brand to tailor, quite literally, was launched. They have a store in Colaba as well – so if you like to personally stop by and get a hang of things, we say head there. Get the right fit, fabric, colour from scratch to the final finish. In their words, ” accessible and luxurious, yet affordable”. Get all of your clothes customised, as and how you like it. Born out of a personal need for finer things in life, the concept of Herringbone and Sui is exactly the same. From pants, to suits, to tie, bags and accessories – they offer all imaginable services. From affordable to the higher end of the luxury spectrum, they offer made-to-measure patterns and garments. In fact, the measurements are kept in the files for future reference as well. You can either choose from their exisiting catalogue, or go in for a custom-made experience, or improve on the existing style you really liked. Find trousers, cufflinks, shoes and even ethnic wear. A typical hand-stitched pair of pants would cost an approximate INR 4,500 to INR 5,000. However, if you go for a higher and more refined fabric, the cost can even go up to INR 10,000 and above. They do pan-India delivery and for a custom-made order, it’ll take at least two-three weeks. So make sure you decide and place your order keeping this timeline in mind. #LBBTip: In a hurry? That’s ok too as they offer express delivery with a standard charge of INR 1,500 – with which they promise to deliver the order within 72 hours.